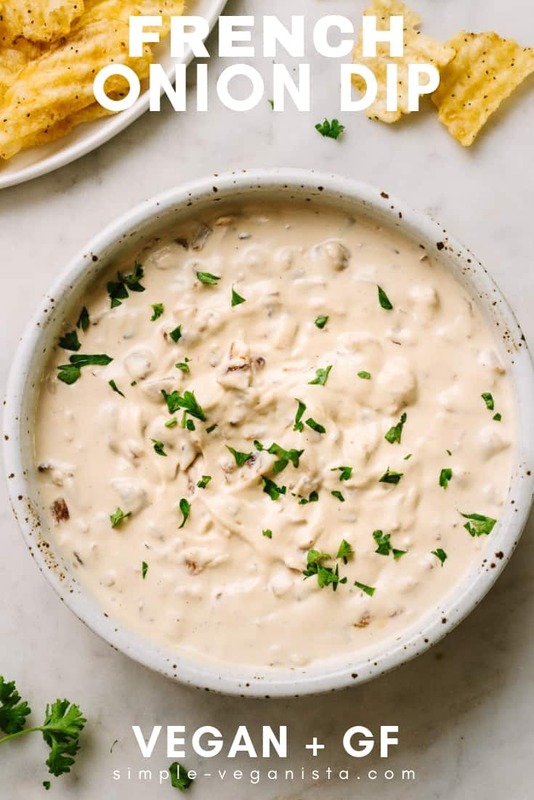 Homemade Vegan French Onion Dip made with caramelized onions, non-dairy sour cream and spices makes for a crowd-pleasing onion dip recipe that everyone will love! 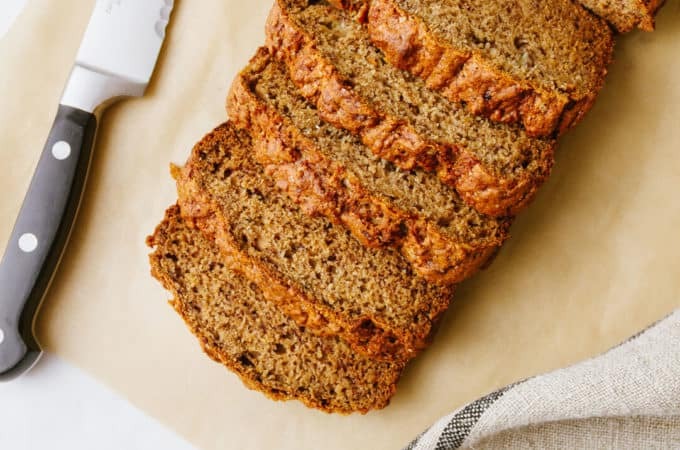 It’s super simple to make, and can easily be made a day ahead. 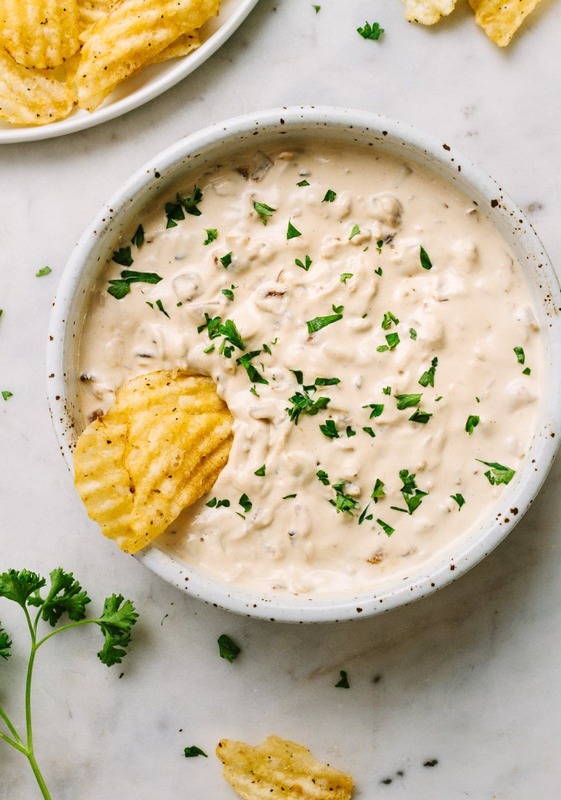 Scoop up this vegan onion dip with chips, crackers and/or fresh sliced veggies. It makes a great platter centerpiece for your next party, potluck, or family/friends get together. This recipe is enough for a small group (6 -8), so double if you’re entertaining a crowd. 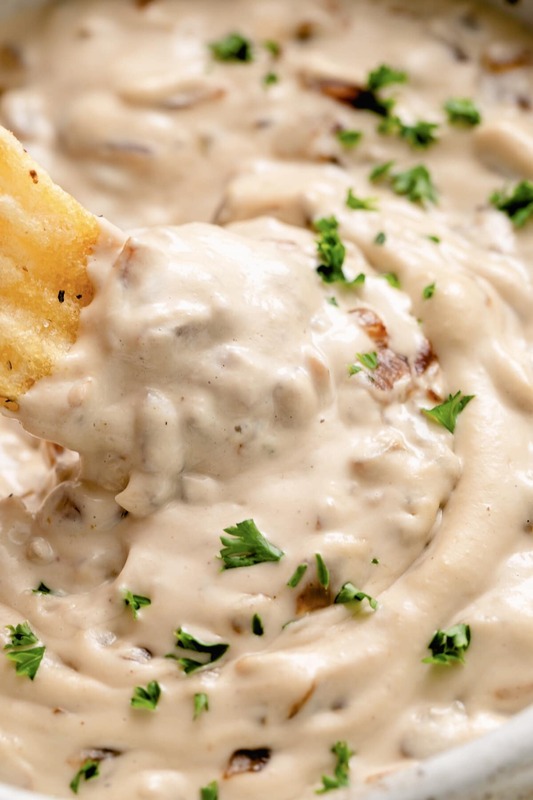 Is French Onion Dip Vegan? It sure can be! 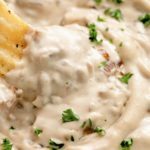 By using this homemade cashew based vegan sour cream or store bought Tofutti, it’s easy to make french onion dip vegan. 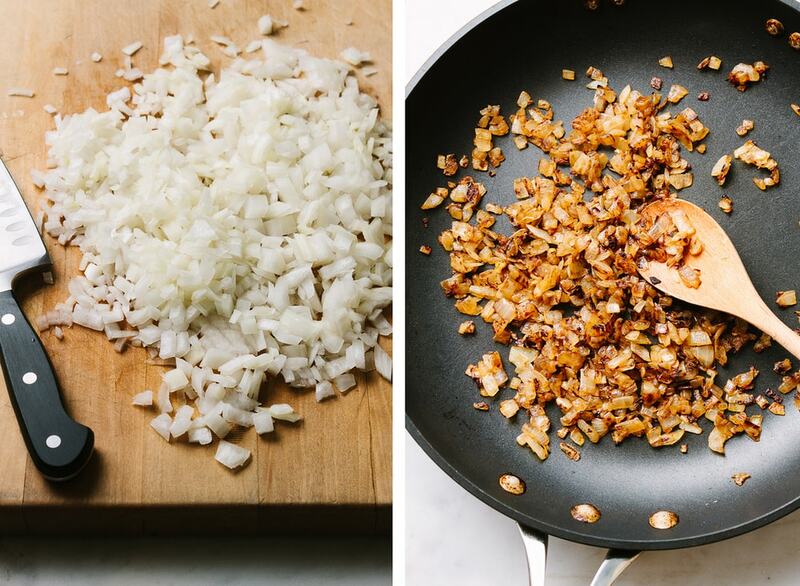 Caramelize the onion: It’s all starts with the onions! Grab yourself a medium – large yellow onion and dice it up well. Heat a little oil/water in a non-stick skillet, add onions and saute for 30 minutes, stirring every 5 – 10 minutes. After every 10 minutes or so, add a little water or vegetable oil to keep the onions from crisping up too much on the edges. Let the liquid sizzle and evaporate completely before adding more. Once done, the onions will be golden, slightly sweet and smell divine! 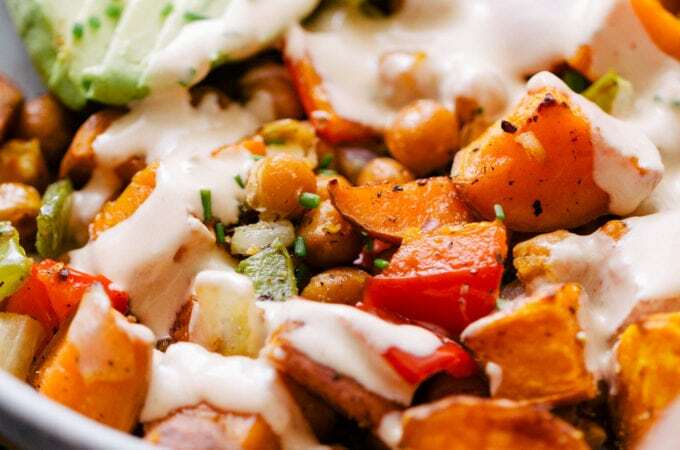 Gather the remaining ingredients – plant-based sour cream, vegan worcestershire sauce, garlic & onion powder, and salt. 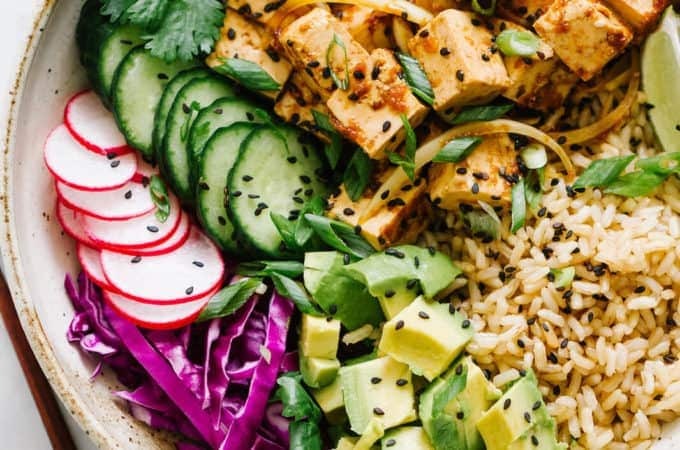 Tip: If don’t have vegan worcestershire on hand, try a little tamari, soy sauce or coconut aminos. You’ll definitely want to add one of these ingredients as it adds a wonderful umami flavor, pairing well with the sweet, caramelized onions! 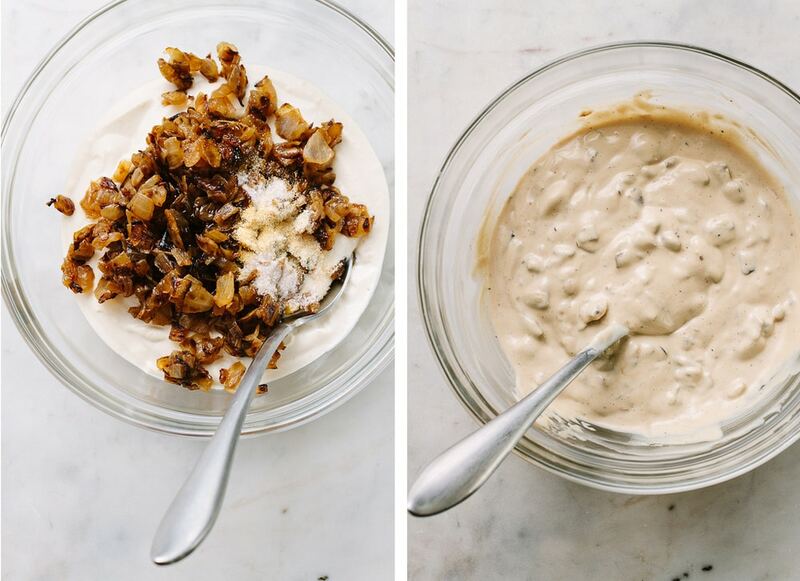 Now you’re ready to assemble, combine the caramelized onions together with the vegan sour cream, worcestershire, spices, and mix well. Taste for flavor, adding extra sauce or spices as needed. Serve right away or store in the refrigerator for an hour to chill. And that’s it my friends, the best vegan French Onion Dip ever – it’s healthy, guilt-free and of course delicious! 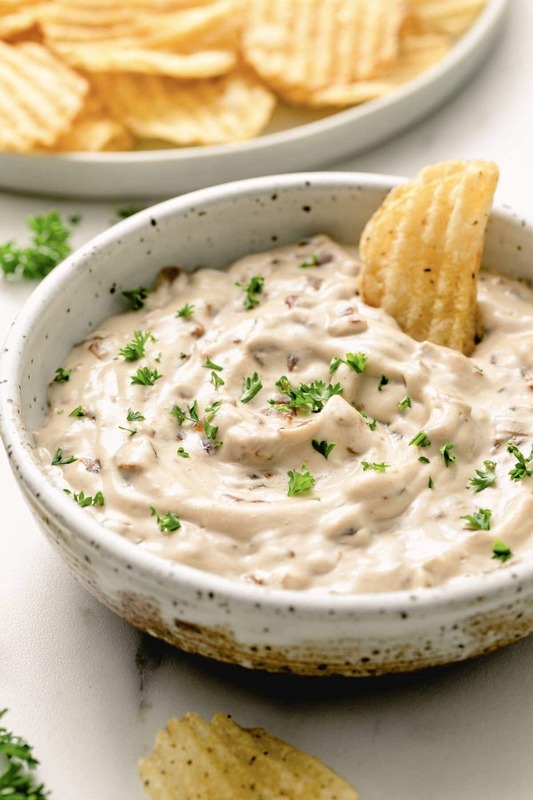 When ready to serve, pair your vegan French onion dip with chips – I love the thick waffle kettle potato chips since they can handle thick dips, but regular chips are great too. 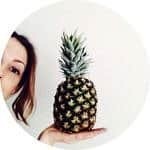 Even tortilla chips, multi-grain crackers, pita chips, veggie chips, bagel chips, or pretzel crisps will work. For a fresh take, fresh sliced veggies is great as well. And if you want to cover all your bases, have a mix of chips and fresh veggies! 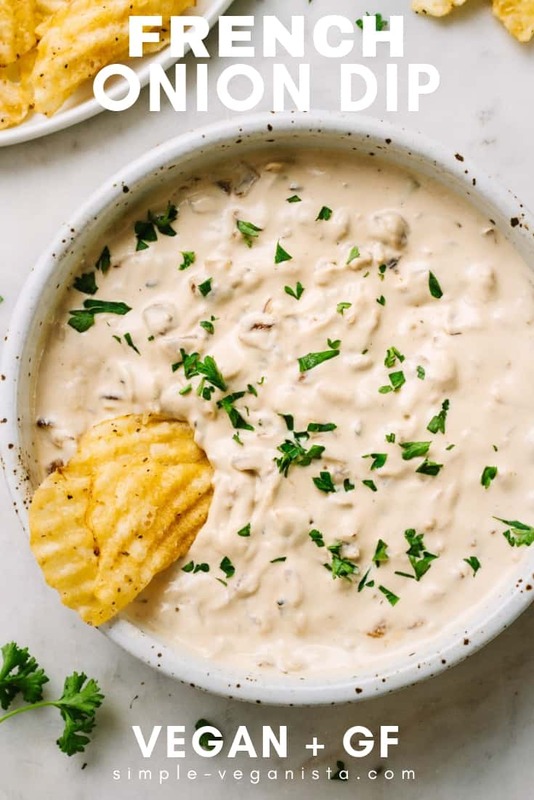 Store leftover onion dip in the refrigerator for up to 6 days. 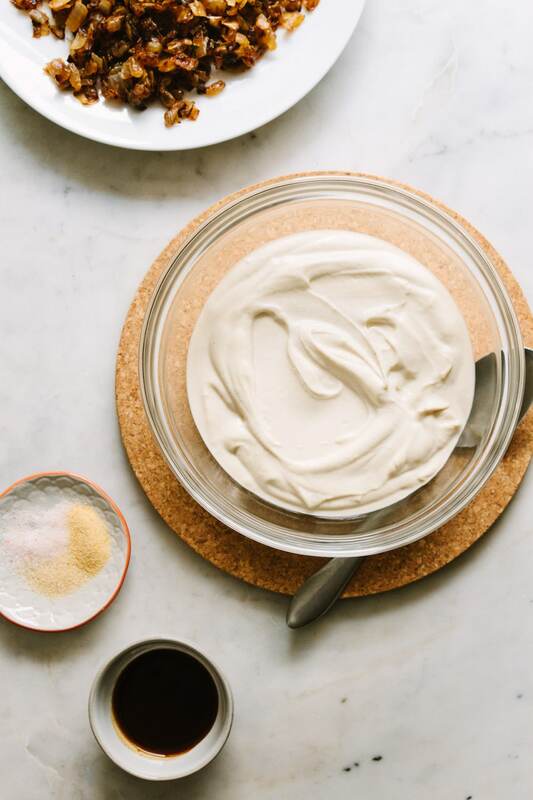 As mentioned above, this easy vegan dip can conveniently be made a day or two in advance, and is ready to serve when you are. See all Appetizer & Snack recipes on TSV! Made this over the holiday weekend and it was a hit, everyone loved it! Thanks for the great recipe!